Livingston Armytage is an Australian lawyer. For most of his career, he has specialized in justice reform and judicial education, carrying out assignments for international agencies such as the United Nations, the World Bank, AUSAID and USAID. He has worked in more than 30 counties, including many of the world’s most troubled places such as Afghanistan, Cambodia, Fiji, Haiti, Palestine and Papua New Guinea. Places of acute poverty often struggling with national trauma, where political and judicial systems are weak and vulnerable. His central concern is justice and the challenges of promoting fairness of opportunity and equitable development for the world’s powerless poor. His Ph.D thesis, Reforming Justice: a journey to fairness in Asia, is being published by Cambridge University Press in April. I’m a specialist in justice reform. My work is concerned with improving the well-being of disadvantaged people who, because of poverty and social inequality, are routinely exploited but denied any access to justice. In 2001 I was posted with my wife, Miyako, to live in Islamabad, the capital of Pakistan. This was a two-year assignment running an $80 million project for the Asian Development Bank, managing a team of 20 international and local experts. The purpose of this project was to reform the judiciary across Pakistan's four provinces. This was the world's largest justice reform project to date, concerned with building courts and modernizing them with technology, conducting law reform and educating judges, among many other things. Like most projects, it had its bizarre aspects. My wife and I lived in the smallest house available, which turned out to be a splendid five-bedroom ambassador's residence. In every bedroom, there was a spa, and each spa was a different colour to suit the owner’s mood or, should I speculate, the ambassador’s fantasy. We really loved Pakistan, despite now being known as a ‘failed state’. The people are invariably hospitable, gentle and courteous. During our first year, we wrote enthusiastic postcards to all our friends, inviting them to visit and describing Pakistan as the world’s best-kept tourist secret. 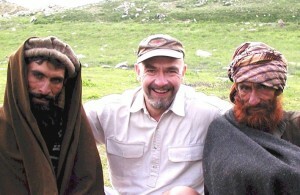 Livingston Armytage with Pasthtun tribesmen in remote Baluchistan, 2001. People think of Pakistan as a hot, flat and arid desert as much of it is, but much of the country is also located in the Hindu Kush, the foothills of the Himalayas. Consequently, there are more of the world’s tallest mountains here than in Nepal, and many more majestic snow-capped peaks than in Switzerland. Pakistan has a strong sense of history and more recently its colonial past, the world of the British Raj. The world of the “great game” when the imperial powers of Britain, Russia and France played out their proxy wars and power games for influence in Central Asia and control of its resources. Pakistan is bordered and in many ways defined by India in the east, Kashmir on the north, and Afghanistan to the west; the centre of an unending maelstrom of conflicting global interests. This was the world of Kim, He Who Must be King and other Kiplingesque adventures. In 1897, Winston Churchill served as a young subaltern in the Malakand garrison near the Khyber Pass between Afghanistan and what is now Pakistan’s North West Frontier Province. How some things never change! On this day, I had travelled to Quetta, the capital of Baluchistan, which is Pakistan's western province. This trip was to organise an important judicial conference where I worked closely sequestered with the Chief Justice and the judges of the Supreme Court. Baluchistan is one of the most remote and undeveloped places in the world. It abuts a mountainous border between Afghanistan and Pakistan. 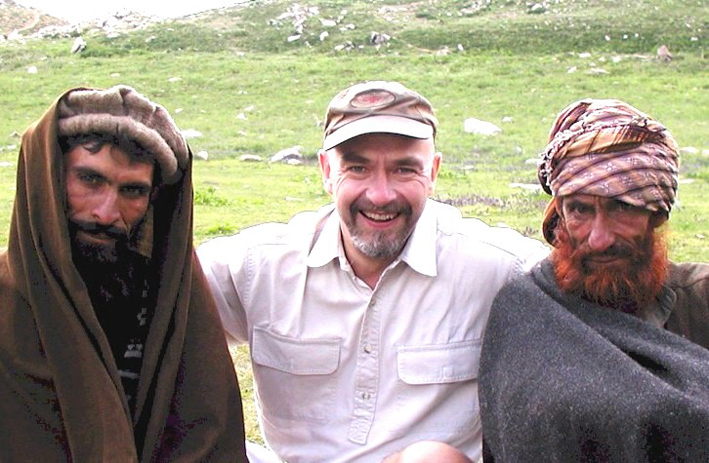 This border – the Durand Line – is the troublesome legacy of Britain’s colonial rule, which cuts through the local ethnic group, the Pushtans, who live on either side, contributing to the ongoing tensions in the region. Pakistan refuses to redraw this contested border because it endows vast natural resources of oil and gas. This is a topical example of historically unresolved issues of justice allowed to fester in the international arena, left to be played out through simmering insurgency and now open armed conflict. It has been speculated that Osama bin Laden was hiding out in Quetta during this visit. Baluchistan's remote mountains and valleys have evidently served as a sympathetic environment for Al Qaeda in intervening years. Oblivious to the portent of this coincidence, I staying in a classically beautiful hotel called the Serena, one of the very few show-pieces of Quetta. It was built, and is owned by, the Aga Khan a philanthropist among other things who supports many worthy initiatives in this area, including many grassroots humanitarian and cultural preservation projects. This hotel is a sanctuary rich in the traditions and the culture of the local Pashtun and Hazara peoples, built in traditional mud-stone and decorated with local tribal artefacts, overlooked by awesomely rugged mountains. On this day, the conference ended and I took the plane back to Islamabad. It is a three-hour flight. Shortly after taking off, we ran into the most enormous storm - the worst that I've ever experienced in a plane. It was a massive monsoonal storm which darkened the sky with boiling purple clouds. There was no way around; we had to pass into the darkness. It was an old plane and the weather was really turbulent. I once knew an aeronautical engineer who explained to me how the wings of planes are designed to be flexible, not rigid. I remembered his telling me that they could flap like the wings of a bird, and laughing in disbelief. I now looked out at the wings of my plane, watching them quiver and tremble, and hoping that what he had said was indeed true. The plane was being flung around in the darkness, thunder enveloping us, lightning flashing through the portholes. The cabin was dark. When I looked around in the strobing light, all I could see was the terror frozen jerkily on every face. We were abandoned. The crew had fled to their seats, and we were completely helpless. The flight was passing over the Hindu Kush, above the peaks of the mountains. One of the most frightening aspects of the experience was that occasionally there would be a break in the clouds. Then I could see the ground looming beneath. We were often very close, not miles high up in the sky. In these ghastly moments, it became altogether simple. There was only one way I could deal with this situation. Our fate was beyond control. It became quite clear: “if I'm going to die today, then this is it.” With this realisation, I was suddenly infused with an unexpected sense of surrender which acknowledged my total helplessness, and relieved me of the fear. All I could do was to sit quietly – almost serenely - which might seem surprising. But on looking back, I now recognise that this was a gift of the latihan. There was a young Muslim woman sitting beside me, who was travelling to Islamabad to attend university. In Pakistan, particularly in Balochistan, westerner males must be very careful about relationships with women. This is a traditional Islamic society in which conduct between men and women is strictly regulated. It is not appropriate for a westerner to speak to a woman without introduction; and even then, you never shake hands. This is a culture of so-called ‘honour killings;’ physical contact is totally taboo. For western males to work in this society, this taboo must be conformed to. So, it was quite a shock when as the storm raged around us, she reached out to seize my hand which she held in a very firm grip throughout the remainder of the journey. Finally, when we had passed through the storm and disembarked in Islamabad, I found the imprint of her fingernails across the back of my hand like the stigmata. Instantly, this unconventional encounter dissolved. She was greeted by her family. We did not even say a goodbye. As I made my way across the airport foyer, I became aware of an ominous stillness. Crowds of people were gathered silent in rapt attention around the monitors which usually announce flight arrivals. Oddly, these were showing television images. I recognized the New York skyline with smoke billowing from World Trade Center. For a moment, I thought this might be disaster movie. But, this was not an entertainment! This was September 11, 2001, the day that the world changed. The storm I had passed through now seems like a prelude, a metaphor, for the “storm” that has overshadowed this part of the world ever since: a turmoil that has engulfed Pakistan and has still not passed. The situation was immediately very dangerous. The US might immediately attack Afghanistan, as it has just years before under Clinton, with unforeseeable results for everyone in the region. As foreigners, we could become targets. A guard was assigned to our home, armed with a shotgun, who snored blamelessly outside our front window each evening. Shielding was erected against grenades in front of the windows of our office. After some weeks, we were evacuated to Nepal. Ironically, as we arrived in Kathmandu, martial law was declared and a curfew imposed across the city owing to the Maoist insurgency. It seemed that we may have been much safer in Pakistan. Despite these local troubles, however, we enjoyed three tranquil months of relative safety in Nepal. I was able to continue to work remotely, and we took advantage of opportunities for trekking around the splendid Annapurna Mountains. We were also fortunate to find some beautiful Tibetan artefacts, one - a five hundred years old carved cover of a Tibetan prayer book - is now displayed in our living-room back in Sydney. When we returned to Islamabad, the project had completely changed its character. Our funding of $80 million was mysteriously raised to $350 million – an unprecedented sum for a justice reform project on any global measure. In due course, it quietly emerged that this was a reward to the then military dictator of Pakistan, General Pervez Musharraff, for allying Pakistan with the US in the new “war on terror”. In the years which have passed, Pakistan has been torn apart by the consequences of 9/11. Now more than ever, it is seen as a “failed state”. There has been a calamitous impact on the safety and well being of its people, the vast majority of whom are poor apolitical and once again collateral of the new ‘great game’. The Pakistan we loved has disappeared, at least, for the present. As for our justice project, this has also vanished almost without trace in the ensuing chaos. The world's largest ever justice reform project has been squandered in the catastrophe. Meanwhile, the injustices and inequities that we were confronting persist. One day, we may be able to return. I do hope soon. The interview with Livingston on which this article is based was conducted by Harris Smart. He plans to include it in his forthcoming book, Footsteps, about Subud.